Chrysler Group LLC continues to win the vast majority of dealer arbitration cases coming before the American Arbitration Assn. The scoreboard: As of July 9, with 73 cases completed, arbitrators decided for Chrysler in 54 cases and in19 for dealers. More than 125 of the 418 filed arbitration cases have been dismissed, withdrawn or abandoned, says Chrysler. Less than 10 cases remain to be arbitrated by a deadline that officially is this week, but is expected to take longer than that. The U.S. Congress ordered the arbitration after Chrysler and General Motors Co. terminated thousands of dealers as part of post-bankruptcy reorganization plans. Chrysler says it is working to meet the statutory requirement to provide dealers who win in arbitration with a Letter of Intent within seven business days. 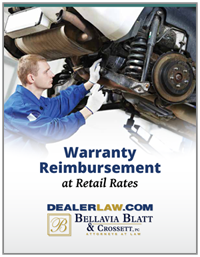 The federal statute provides for reinstatement for dealers who win in arbitration. But that (reinstatement term) applies to GM because their dealers were not rejected technically, a Chrysler spokesman says. Chrysler immediately terminated dealers. GM, in not renewing franchises, did a so-called wind down extending to next October. GM also called back several hundred dealers on the eve of the arbitration hearings. Chrysler says in a statement: The company is complying with the federal statute by issuing a customary and usual Letter of Intent to dealers that prevail in arbitration and is looking forward to discussions with prevailing dealers. But attorney Leonard Bellavia of Mineola, NY, explains Section 747 is a federal reinstatement statute for GM and Chrysler dealers who were either rejected (Chrysler) or wound down (GM) in their respective bankruptcies. The only distinction is that in the GM case its dealers were told if they signed a wind down agreement, which gave them up to 18 months to close along with a modest stipend, it could avoid the same immediate rejection that occurred in the Chrysler bankruptcy case, he says. The decisions to select dealers for the new Chrysler dealer network were carefully considered as part of Chrysler’s Genesis project, its dealer consolidation plan, the auto maker says. His firm has handled 38 dealer arbitration cases, mostly against Chrysler. The GM cases, he says, largely were settled outside of arbitration hearings. Theres more evidence every month showing that Genesis is not working, he says. At GM, its a different story, at least as far as its wind-down dealers are concerned. GM says that last March it offered LOIs to 666 dealers to return to the fold. Of these, 600 were reinstated, spokesman Dave Roman says. Others in the arbitration process dropped out or settled otherwise, he adds. Once GM dealers meet the LOI terms, they will be able to start ordering new vehicles, Roman says. Some have reported the returning number as high as 900, but GM officials say thats misleading. In March, Mark Reuss, GM president-North America, said the number of dealers would fall between 4,100 and 5,300. But he was rounding off the numbers, Roman says. Then in mid-May, Reuss told the Associated Press GM would end up with about 5,000 dealers, meaning about 900 of dealers who were initially on the termination list were being brought back. In a late-June investors meeting, GM told investors it will have about 4,500 U.S. dealers within a few months, down from 6,150 before bankruptcy. He spoke of spending a lot of time on the dealer-alignment strategy. This (dealer network) is our competitive advantage and not easily copied over time, Reuss told investors. Whatever the final count, the fact is we will end up with somewhere between 4,100 and 5,300 dealers when the arbitration process concludes later this summer, GM spokeswoman Ryndee Carney says. GM had more than 300 arbitration cases in early May, and less than 100 are scheduled for completion by July 14. Officially, arbitration cases have to be heard by July 14.It will likely take a little longer than that for all of the decisions to be rendered. We expect to complete the process later this summer, Carney says. In bankruptcy court last year, Chrysler and GM said they had too many dealers to be competitive, because their networks were constructed when domestics had a much bigger share of the U.S. market. They needed to whittle down to compete against the Toyota Motor Sales U.S.A. Inc. and American Honda Motor Co. Inc. and Hondas with scaled down networks. As a result of court-ordered restructuring last year, Chrysler and GM initially said they would shed some 2,800 dealerships as part of their reorganizations.